Ford might be a bit behind in the electric market, but that could soon change. Ford plans to launch a fully-electric vehicle with a 300-mile-plus range sometime in 2020. The new vehicle is “Mustang-inspired,” according to Jim Farley, Ford president of global markets. Farley has mentioned the Mustang relation several times now, which should translate to an electric utility vehicle that goes fast. At one point, the Mach 1 was the designated nameplate, but after a tidal wave of backlash from Mustang enthusiasts, Ford’s now pretending that such a decision never happened. “Our strategy is different,” said Farley on Tuesday at the Automotive News World Congress in Detroit. “In a way we had the advantage of watching what happened the first time around. What customers have told us is ‘Just give us the good stuff. '” The Detroit News says that Ford global product chief Hau Thai-Tang claimed that Ford’s electric-vehicle business won’t be a drain on profitability. This statement came in a presentation to Wolfe Research on Tuesday. Automakers historically had difficulty profiting from sales of EVs. 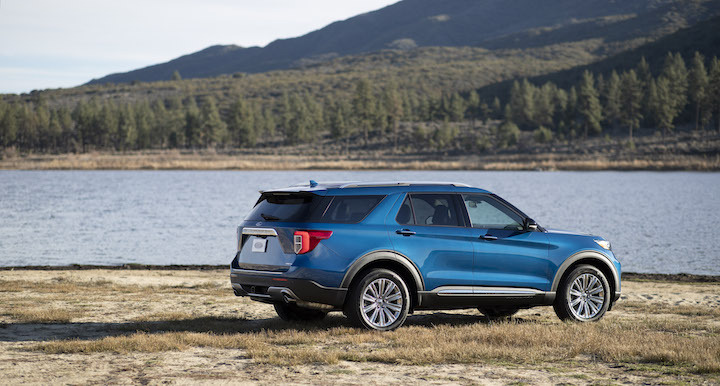 Ford announced four all-new vehicles during the Detroit auto show on Monday, including the company’s first-ever hybrid Explorer SUV. Ford is currently making efforts to change and adjust to the modern, and electric driven automotive industry. Farley is responsible for many of the changes being made. Under current CEO Jim Hackett, Ford’s senior leadership is pushing to trim $25 billion in operating costs and spend $11 billion to shake up failing businesses in Europe, China and South America, and better position the automaker’s North American business for continued profitability through the next decade. Efforts are also being made to revive unprofitable business in Europe. Ford will begin by cutting salaried and hourly workers, end production at plants in France and Germany, and eliminate less-profitable vehicles like the C-Max from the lineup. Ford enters 2019 with several new vehicle announcements and launches planned, including some electric variants to shake up the future of the brand. Ford’s midsize Ranger is back in U.S. showrooms this month and Lincoln’s all-new Aviator is right around the corner. Ford plans to launch the new Explorer, all-new Escape and refreshed Super Duty in 2019 as well as the long-awaited return of the Bronco. Most recently, an official partnership between Ford Motor Company and Volkswagen AG has been formally announced. The partnership appears to initially encompass joint venture on commercial vans, midsize trucks, as well as collaborating with autonomous vehicles. As unfortunate as it is that the v8 engine is going away and getting replaced by smaller engines and electric, I watched a clip on the Ford GT that made me “hopeful.” The 3.5L Ecoboost V6 is a fairly decent engine and makes decent power. In the Raptor, the 3.5L makes 450hp and 510lb-ft of torque, compared to the 5.0L which makes 460hp and 420lb-ft of torque. The Ford GT also had different modes to reduce turbo lag and improve throttle response along with having a better exhaust note than the Raptor (or most anything with an Ecoboost). Now, for Ford to take that engine and put the electric-hybrid 10-speed driveline behind it and bump the power to roughly 485hp and the torque to 550lb-ft, give it an AWD system derived from the Focus RS with the upgraded Hybrid-electric differentials, the new CD6 platform, Brembo brakes, a performance tuned magnetic ride setup, Performance Pack Level-2 spec wheels and tires, an evolutionary body styling, and tech upgrades to the inside (Heads up display, infrared pedestrian night vision detection, BLIS, digital instrument cluster, larger infotainment screen, B&O stereo, puddle lights, illuminated door sills, ambient lighting, LED illuminated cigarette lighter ports, LED lighted heated/cooled cup holders, LED lighted interior and exterior door handles, LED lighted USB ports), Ford would have a pretty decent car. giving the car louvered glass quarter windows, a shape similar to that of the new BMW M850i with the ford body language with the grill, evolution of the headlamps, functional quarter vents styled like the 1969 Mach 1, a rear spoiler with a gurney flap (similar to the current GT350), a different three-bar tail lamp setup, with black housings and LED lighting, a dual ram hood (71-73 mustang Mach 1) and things like that and the mustang would be great. Instead of a manual offer the 7-speed DCT as an option and call it a day. introduce a V4 2.3L twin turbo Ecoboost with 405hp/450tq with the 10-speed hybrid-electric auto, the same AWD system and braking system and suspension system from the GT, a single scooped hood, and unique grille and spoiler for the turbo-4 (something like what the current GT performance pack level-1 has) and call it the Mustang RS. I also think it’s time to retire the Shelby name from Ford as the Mustang will be taking a different route in performance. I also think that with the new direction, the performance mustang should retire the Cobra, an in its spot, the Black Mamba should take it’s place. These cars today are much quicker than any mustang that has come before it and seeing that the Black Mamba is the fastest venomous snake, it would be a fitting name for the new performance mustangs. The black Mamba cars should carry a darker appearance along with improved performance with things such as bigger brakes, a 7-speed DCT from the current GT500, carbon fiber driveshaft, different suspension setups, aggressive aerodynamics upgrades, and styling upgrades and be offered on both the 3.5L and the 2.3L cars. An all electric variant would take the place of the current GT500 and would compete with cars like the Tesla Roadster, the upcoming Electric Corvette and possibly a new electric Viper from Dodge. Take those same ideas, for a performance sedan on the CD6 platform, make a 2.3L Turbo-4 and call that the Falcon RS and a 3.5L Ecoboost Falcon GT along with Black Mamba packages and a Electric performance sedan to compete with the Tesla Model-S sedan. Same thing with whatever this Mustang crossover is going to be (hopefully Maverick) with a Maverick RS 2.3L V4 Ecoboost and a Maverick Grabber 3.5L Ecoboost Crossover with Black Mamba packages (along with whatever the electric variants of these are going to be to compete with Tesla Model-X). The Maverick should take a lot (99%) of its styling from the EVOS concept and be on the CD6 platform, Even the explorer needs a 3.5L RS version but the RS version for the explorer would top the Explorer ST. If Ford is going to get serious about all of this small engine and hybrid and Ecoboost stuff, the trucks would need to get in on this as well. People are still going to want gasoline performance engines, even if electric hybrid systems are installed to enhance performance. Trucks like a next generation F150 Lightning with a 550hp variant of the 3.5L V6 with the hybrid 10-speed pushing torque numbers up to around the 600tq mark, a Hybrid Raptor with electric upgrades for the bed for people who camp and do off road stuff. Same thing with this upcoming Bronco (which should look like the Bronco6G renderings and be based on the gen-2 ranger platform) and the new Ranger. Both of those two vehicles should be offered with the 3.0L Powerstroke Turbo diesel, a 2.7L Ecoboost and a 2.3L V4 Ecoboost. This would satisfy the performance market and CAFE regulations and everything like that since everything would be a hybrid engine and nothing would have more than 6-cylinders and the V4 would sound “similar” to the V8. Do you know what paragraphing is?! With the news that came out today about the V8 hybrid setup, I’m once again excited by what Ford is doing but it also makes me truly wonder what is in store. I do have my speculations just looking at some of the glimpses of what Ford has going on and (just in speculation) here are my thoughts. 2.) Mustang inspired crossover (Maverick): Yes I know that Ford is working on this as an “Electric vehicle, but make no mistake, a Mercedes GLE or BMW X6M type Mustang inspired crossover with an AWD hybrid 5.0L Powertrain setup would seal the deal for ford in a good way. CD6 platform, AWD, 10-speed hybrid drive line possibly derived from the Focus RS, 485-495hp, maybe 520lb-ft of torque to compensate for the added weight, Huge Brembo brakes, 21” wheels on 295/35R21 front and 315/30R21 rear tires, magnetic ride, aero upgrades such as a rear spoiler, side skirts, under body panels, front lip, rear diffuser, quad tipped active mode exhaust, mustang inspired interior for five people, decent cargo space, etc and Ford would have an awesome crossover. 3.) Explorer. Yes a Hybrid 5.0L explorer to slot in above the “Maverick” Ford needs and Explorer GT 5.0L Hybrid V8 powered SUV with the 10-speed hybrid automatic transmission behind, it, a performance AWD setup Brembo brakes, Magnetic ride, active exhaust, improved aero, more performance oriented interior, Premium stereo and all that. pushing out the same 485hp and somewhere in the 485-500lb-ft of torque it would compete with the SRT Durango and SRT Grand Cherokee with less weight and lower price. 4.) F150 & Expedition: First and foremost, the Expedition is the sexiest thing Ford has EVER made. That SUV deserves a hybrid 5.0L V8 under it’s hood. It Deserves Brembo brakes, it deserves Magnetic ride, It Deserves an active exhaust, it DESERVES a better set of 22×10″ wheels, it Deserves a blacked out sports package (that is not to say it will be racing “The Ring” or anything like that). The Expedition needs four exhaust tips sticking out from behind the rear wheels bellowing the voice of a 5.0L coyote hybrid V8 with about 460hp and 500lb-ft of torque. We also need some different 5.0L Packages on the F150, such a a lighting, a harley davidson package (that also needs to be a package for the Expedition), a 5.0L 4×4 off road package FX4 pickup with a lifted suspension and other stuff to challenge the Trail boss and the Rebel (just with less power). There should also be a supercharged 5.2L Raptor with the hybrid 10-speed to challenge the upcoming Rebel TRX. What I am looking forward to seeing is the F250 High Boy pickup, hopefully the 7.0L V8 will appear in that but what I’m really hoping for is a new Power Stroke V8 to out gun the new Duramax diesel in the Ram pickup truck with hopefully 510hp and 1100lb-ft of torque. Talk about awesome! Prayerfully the Bronco will be a success when it arrives. I’ve seen the new Ranger already and its a fairly decent truck. The cabin could have been a little bigger but i know the next Gen Ranger will be available soon so hopefully that rear seat will be a little bit roomier. Now a Hybrid 2.7L Ecoboost V6 would be more than enough for the Ranger and the Bronco, putting down 385hp and probably around 410-420lb ft of torque would be exceptional numbers for those two vehicles. I’m hoping for a Ranger Wildtrak, an Off Road ranger (not raptor), an Eddie Bauer-like package for the Bronco (hopefully it will look like the Bronco6g renderings) with a 10-speed hybrid auto and hybrid front drive system (for the non-off road package, a 10-speed hybrid auto with an off road 4×4 setup, and a 7-speed manual off road setup 4×4. I’m still curious about this baby bronco and Ford “Courier” thing. Overall Ford might have something really good going on in a few years. Hopefully they don’t mess it up.